All of us have a very particular set of life rules that govern how we live our lives. These rules ensure consistency and that we stay the same person every day and adhere to the the values we embody. I recently read Tony Robbins book “Awake the Giant Within.” One chapter is devoted to the topic of the rules that govern our lives. In this context, a rule is governed by the events and conditions which have to happen for the experience to be positive. How we structure our life rules go a long way towards living a fulfilled life. In one example, Robbins talks about friendship. He was having a conversation with a friend about their conditions for friendship, and their opinions on what they considered a true friend variety greatly. Let’s look at friendship using my definition and see how we could differ in the rules we have. For me, friendship is a deep bond with another person whom I trust, lean on, and learn from. I have no problem going out of my way to help a friend, especially one who has been there for me in the past. I don’t need constant communications with friends either; weeks can pass without communication and it will not affect the quality of the friendship. However, your rules for friendship could be entirely different. Maybe you view a friend as someone who contacts you at least three times a week. Maybe you need to see them once a month for you to consider them a friend. And say this doesn’t happen. You are left feeling as though you have no friends because they did not meet your standard which is determined by your rules around what constitutes friendship. Your friendship experience is not positive because your preconceived notions do not allow it to be so. 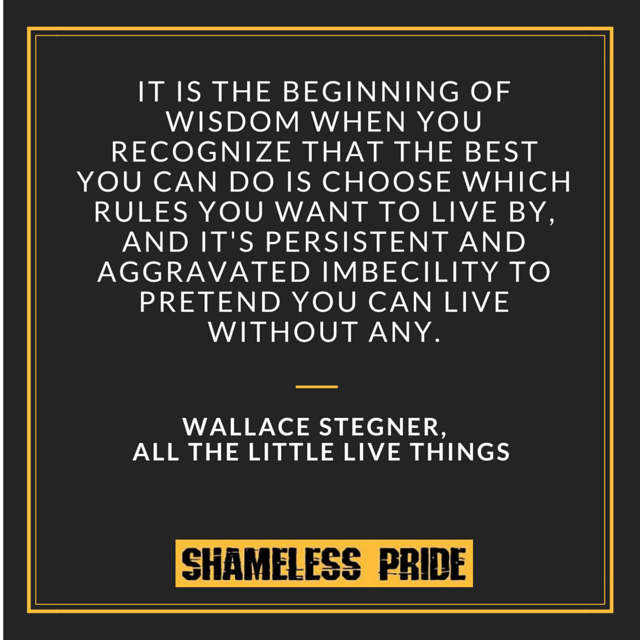 What happens with our life rules is that we often set the bar unreasonably high, leading to disappointment, even a sense of anxiety and failure. Because our rules are often non-negotiable and strict, we are let down and unfulfilled by people, experiences, and events. Even work ethic can be affected, as you’ll feel unsatisfied in your efforts due to a strict interpretation of your results via your life rules. For all of these issues, faulty rules are the problem. There is a tricky trade-off between being ambitious and setting ourselves up for failure. Sometimes, we expect too much too soon, and that is unrealistic. Robbins found that the majority of people have too high of a threshold to feel pleasure and too low of a threshold to feel pain. This means that our rules have lots of ways for us to fall short, and very few ways to feel accomplishment. 1. The rule must be possible to meet. Unrealistic expectations can lead to feelings of disappointment and stagnation. This is often the case with aggressive, long-term goal setting. We put too much on our plate, and can’t help but feel let down when we don’t achieve what we set out to do. The same holds true in relationships; we have a fantasy level expectation of how other people should act and behave, and are disappointed when they constantly break our rules. Instead, focus on realistic rules. When it comes to tasks – break items down into achievable, manageable chunks that can be consistently completed over a predetermined time frame.For relationships, understand that our views are often selfish and based on our perception of reality, which is never mirrored by those around us. 2. The rule has to be in our control, and not dependent on someone or something else. Think about some of your life rules and standards. Are you often let down because someone doesn’t live up to them? This is a common experience and is one of the main issues with unrealistic rules. We can’t control the actions and the behavior of others, nor can we get people to do what we want them to do (even though it may seem possible, at times). Instead, our focus needs to be on ourselves, in doing all we can do to enhance our lives, irrespective of what’s happening around us. Our rules need to be in line with our passions, beliefs, and principles – all things that need to be dependent on us, and us alone. Such an internal focus does not mean we will never be disappointed. However, it ensures that we understand that we can only control our lives – that the noise, drama, and despair of humanity is not within our sphere of influence, no matter how upset or aggravated it may make us. Life consists of a series of events that we interpret in ways that make the most sense to us. How we interpret these events form the basis of our reality and form our expectations and rules for happiness. I call this the “eye of the beholder” rule. What is disappointing to one man is a treasure to another. Is that because some people are more ambitious than others? Or because, by luck, some of us were born into more favorable circumstances? Both are often true. But our happiness and sense of fulfillment is a direct result of how we perceive the world around us, and specifically, our mental makeup. In order to limit disappointment due to unreasonable standards, our rules must be flexible. We must create multiple ways for us to meet our internal requirements, that “please” the rule, so to speak. I recently began to study and practice copywriting techniques. I found a few resources that give old, successful examples of famous copy that sold millions of dollars worth of products. I read up on some famous copywriters of the 20th century, and began implementing their techniques into some of my social media posts. I continue to practice various forms of copy, and use deep thinking to visualize how I can make use of this writing form in my work. Now, depending on the criteria of my rules, this experience can be viewed as a success or a failure. I have an abundance mentality and believe in a growth mindset, that we have the ability to learn and grow into whatever we dedicate consistent time and practice to comprehend. Because of this mindset, I am happy with the progress I have made in learning and implementing copywriting. I have taken a topic I previously knew nothing about, studied it, and began to practice and implement it. However, if I had a different set of rules, I could have felt disappointed with my progress. What if my internal rules required that I make money within six months of learning a new skill? Surely I would be met with constant disappointment. This kind of rule, while ambitious, is detrimental and demoralizing. How we frame our relationships, views, and habits are crucial. Make sure your rules allow you to feel good about the little things. Gradual progress matters, as does appreciation and acceptance of other people’s faults and weaknesses. Flexible rules aren’t meant to dissuade ambitious work or thinking, but meant to keep our expectations and perceptions in balance to avoid burnout and disappointment. If we demand constant perfectionism in ourselves and those around us, we will be let down every single time. Flexible, realistic rules allow us to be excited over the “little things” in life, the small improvements we are able to make every day. We want our rules to add value to our lives, but not in a way that takes away satisfaction for life. Using the three principles above, you must replace your limiting rules with empowering rules. Robbins explained how we need to look at our “must do” rules from time to time to decide if we need to implement a more flexible mindset. When we must do something, we leave no room for interpretation. It either gets done, or it doesn’t. If it doesn’t, we have not succeeded. Our rule has been violated and we don’t feel good about it. When we should do something, we have a bit more wiggle room. These are rules that we stand by the majority of the time, but can be convinced to adjust them on occasion. When we can do something, we leave our rules open to our own interpretation. This mindset gives us multiple avenues to pursue a solution, and allows us the flexibility to feel achievement in multiple ways. Our core beliefs needs to have a healthy balance of “must do,” “should do,” and “can do” rules. Too many of us are out of balance with an unhealthy dose of must do rules, and this is an enabler of disappointment and anxiety. 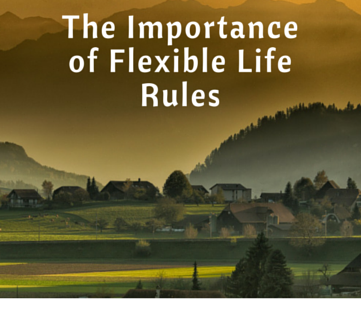 Don’t think of flexible rules as lowering your standards. Think of it as allowing yourself a series of successes that positively impact your self-esteem and capacity to grow. When you think of these areas, do any stand out as disappointments? Is it a motivational issue or are your rules out of whack? Are they too strict and ultimately disempowering? Unrealistic expectations are commonplace. The good thing is that our rules can be analyzed and adjusted to be more in line with realistic expectations. Examining the rules that govern our lives is a vital part to growth and development. Take some time to analyze your life rules to make sure they are allowing you to “win at life,” and not discouraging you to grow and improve, and have an overall positive sense of life. Remember: Life is all about how we interpret things. An adjustment to our perspective can go a long way in seeing massive improvements. P.S. As I mentioned above, this concept was taken from the book “Awake the Giant Within.” You can buy the book here. If you have any comments or questions about setting rules, leave them in the comments below! If you like this article, and want more of them, be sure to sign up to my weekly e-mail list. You’ll also get 2 free gifts, including two 35-page eBooks: one on developing sustainable muscle in the gym and one for attracting (and retaining) girls through online dating.